On Saturday the Ducks were on the field at Autzen stadium. It was a private scrimmage between Oregon players and there was no open period for the media. 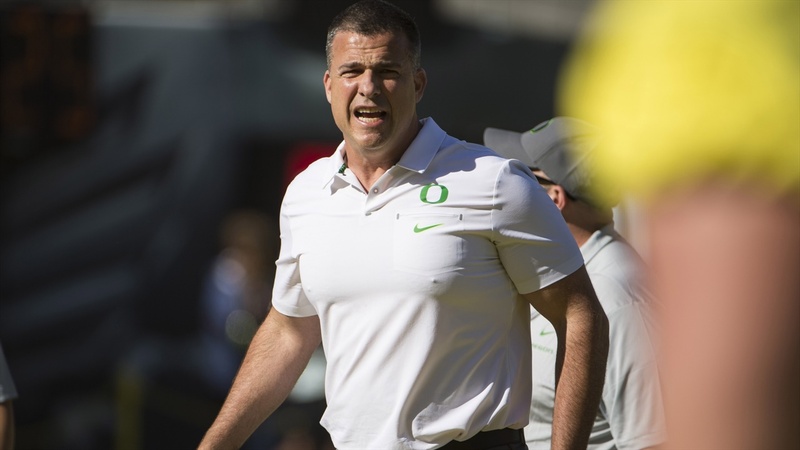 However Mario Cristobal met with media after the scrimmage to detail it and highlight some top performers. You can watch the entire video below or read some of the highlights posted below. Also here is the practice report from Oregon SID Patrick Pierson. Q: How healthy are the guys? A: We are nicked up I don’t think we are injured a couple guys had some, I wouldn’t call them pulls, some strains, soft tissue soft and we are going to try and play everyone in the game. Q: How much has this spring been about identifying what he [Cyrus] can do beyond the goal line? Q: What is the competition behind Justin look like right now? A: Tyler is heads and shoulders above everybody.. the guys got a really good command of the offense. Q: Can you name some improved players? A: Johnny Johnson is a guy that really stands out, Brenden Schooler stands out at the receiver position. Sampson Niu is really playing good football so is Isaac Slade-Matuatia. Drayton Carlberg is a guy that is always getting better. The freshman in general. Thomas Graham and Deommodore Lenoir are always working on their craft. Q: What’s Andy’s timetable for the defense? A: He put a lot of it in and we need to and we can’t slow down… its been steady and its been strong but it’s an aggressive defense. Q: What have you seen from the second and third string offensive line guys? A: I’ve been really happy with a lot of guys. A guy I want to mention right away is Alex Forsyth, Alex has had a tremendous spring. We have played him at multiple positions and he is just a grinder and fight to the finish. He’s been with us a couple seasons and his time is now, he is ready to play winning football. Malaesala is a massive individual and a guy with a lot of pride. Speed, power, and explosiveness he has all the tools and he’s getting more polished. Randazzo did play today and that is a huge step for a player. Chris was a little nicked up but he played great today. He was a guard in high school but he is playing on the interior for us… and I’m telling him everyday brother you better get aggressive and you better get nasty and you better bring it because when you do that you see flashes of a guy that can play great football. George Moore is a guy that can play tackle for us and is pushing for a starting job. Q: How is Juwan settling in? A: He’s seamless… we are blessed to have him.